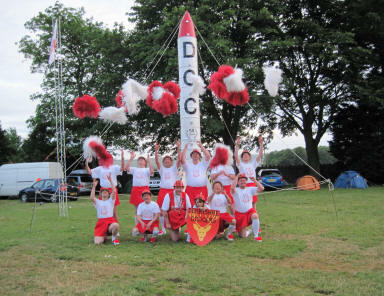 What has space travel to do with the DCC? 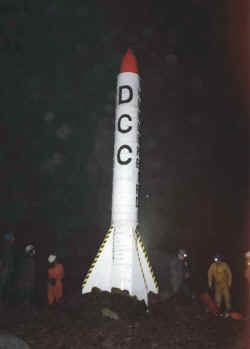 In 1993 the DCC embarked on the first lunar expedition to be launched from the Yorkshire Dales. 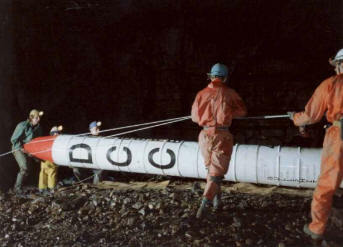 In order to maintain security, the rocket was placed under the watchful care of the Bradford and hidden in Gaping Gill Main Chamber. On the arrival of the Bradford for their winch meet, the rocket was unfortunately tampered with leading to certain strange noises and lights being emitted and it never left its launch pad under its own steam. 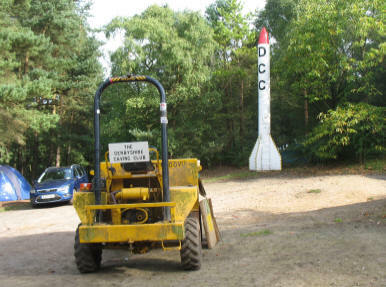 The Bradford kindly removed the rocket to their own depot for refurbishment from where it was wickedly removed by DCC members unknown. It was however later seen at the Cavers' Fair at Pindale in Derbyshire. The pictures below show the rocket in position and being filched from the Bradford. Anyone recognising the people on the pictures ... should keep very quiet. 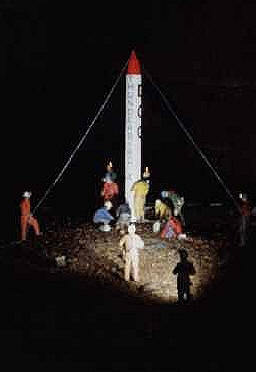 The rocket being prepared for erection by a skilled team of underground technicians led by Werner von D****** and others. Standing proudly erect in the Gaping Gill Main Chamber. 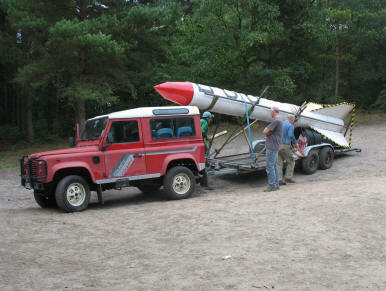 After preparation for launch. 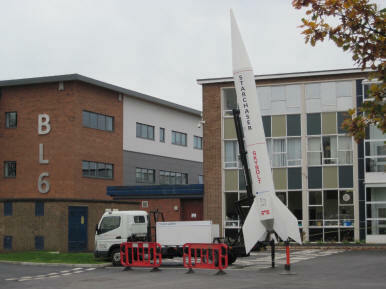 Note the critical angle at which the rocket has been erected to enable it to escape from the main entrance. After the unsuccessful launch when the rocket was being recovered from its temporary storage by the Bradford. 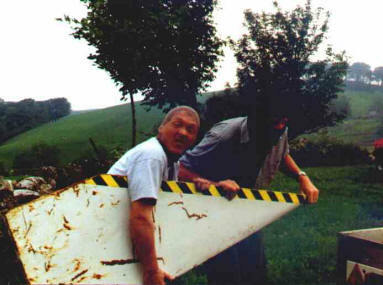 Recently, Bill released the never-before-seen video of the installation of the rocket which can be seen below (provided you have Flash viewer installed). TECHNICAL NOTE: The rocket was powered by British Usufructal Lunar Landing Speleologically Heterodoxical Illationary Thaumaturgy. 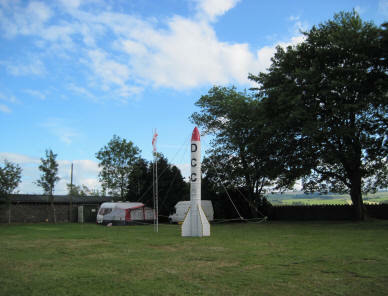 The current resting place of the remains of the rocket is Steve's garden which pretty well assures that it will never be lost or destroyed!